Participation in the exhibition entitled „Design Resistance”. An exhibition based on the concept of the International Artist of Residence in Debrecen 2018. Modem – Muzeum of Modern Art in Debrecen. Hungary. Participation in the exhibition entitled „Ćśśś„, Jedna/Druga Gallery, Szczecin, Poland. A lecture and presentation on the activity of the design studio Poorex. Modem – Muzeum of Modern Art in Debrecen. Hungary. Participation in an artistic residence in Debrecen, Hungary. The statuettes are once again done by the Poorex studio, but after a slight redesign, this time in a slightly more hybrid form. Lodz, Poland. 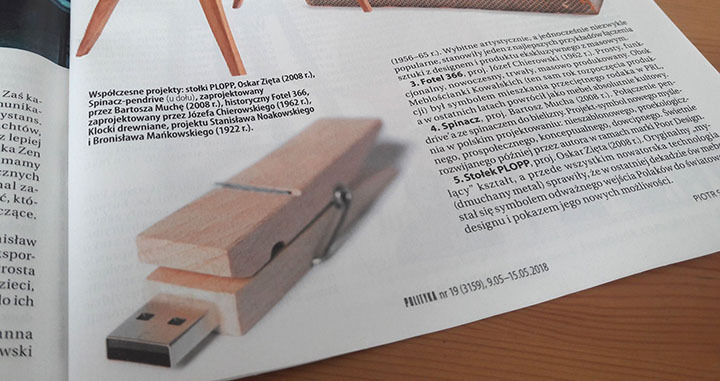 The „Polityka” weekly opinion magazine has placed project Spinacz USB (designed by Poorex) in the top 5 of design icons. A subjective though nice award. Participation in the exhibition entitled „Motherland in Art”. Mocak, Krakow. Participation in the exhibition entitled „The other side of things”. Polish design after 1989This exhibition surveys the development of Polish design after 1989. It shows how design artists coped with the budding capitalism in the 1990s, what imprint Postmodernism left on their works, how they joined in the international trends in design at the turn of the 20th and 21st centuries, and how they strive these days for individuality in an attempt to measure up to the competition on foreign markets. The economic efficiency is not always the only determinant of the form of a product. National Museum in Krakow, Poland. The NMW has something special in store to mark the end of 2017. Starting from 15th December, Polish applied arts will be on permanent display in the Gallery of Polish Design, showcasing the most important pieces from the early 20th century up to the present day. Poorex also shows some projects. NMW, Warszawa, Poland. A Lodz Design Festival has appointed studio Poorex to design the statuettes for the Make me! award. Lodz, Poland. The exhibition of Polish Design presents a selection of works by 30 Polish designers. Concordia Design, Poznan, Poland. M. Žilinsko dailės galerija, Lithuania. Participation in the Exhibition of Polish design in Seul. Dongdaemun Design Plaza, Seul, South Korea. Exhibition of Polish and Norwegian design. Now in new place: Nordenfjeldske Kunstindustrimuseum, Trondheim, Norway. BWA Zielona Góra shows exhibition of „Lekcje Designu”, and there You can see Mięsolamp and Antymiś from Poorex collection. Continuation of exhibition „Lekcje Designu”, Gorzów, Poland. launching new project: 100% of the norm. Exhibition of Polish and Norwegian design. MCK, Krakow, Poland. Exhibition of Polish Design in Bulgaria, Sophia and Concordia Gallery, Poznan, Poland. Design Dialogue: Poland Brazil presents photos of Taczkolyska. Museum of Modern Art Rio de Janeiro. 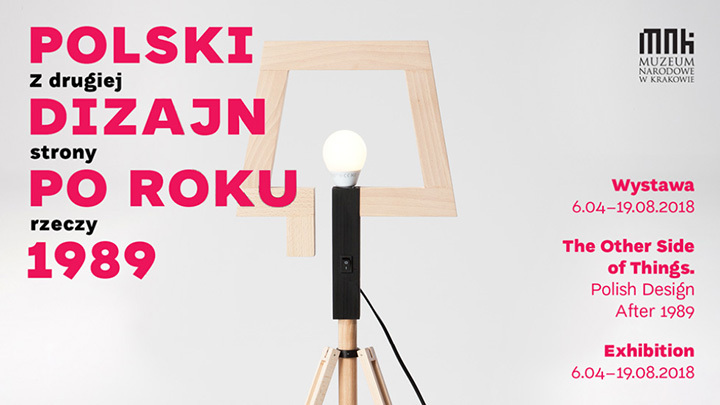 Institute of Design Kielce invites you to an exhibition of „Lekcje Designu”, and there You can see Mięsolamp and Antymiś from Poorex collection. Budapest Design Week presents Taczkolyska. 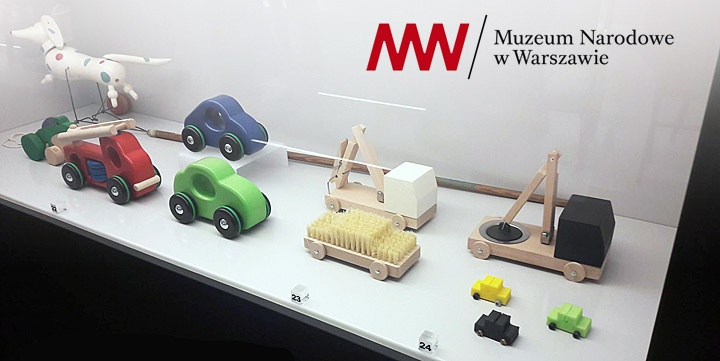 The Poor Toys are presented on Design Festival – Kids Love Design – Poland / India / Iceland. International Art Fair Warsaw 2016. The exhibition of eight artists, designers of graphic, textile and product design. Author of the project Nena Skoko. Belgrade, Serbia. New book made of Poorex Studio is ready. This publication includes four collection of everyday household objects designed and produced, in greater or smaller series, in 2012-15. Designbock festival. The Exhibition Polished Up presents contemporary Polish designers. Poorex presents the Tripod Collection. Prague, Czech Rebublic. Month of Design Ljubljana. 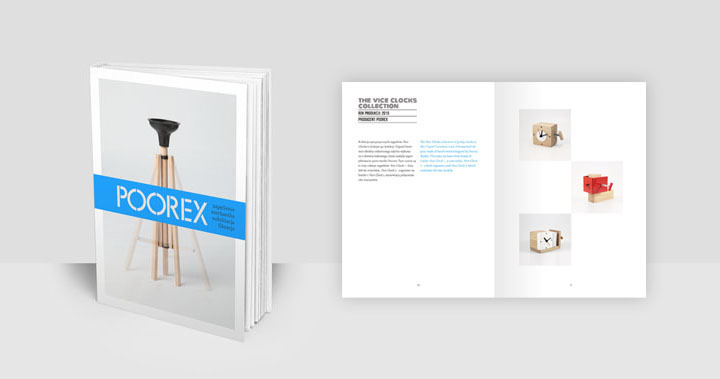 Poorex presents the Vice Clocks collection. Lubljana, Slovenia. Polish Design in the middle of in Jakarta, Indonesia in Dia.Lo.Gue. Gallery, Kemang Section no.4: Selected products and furniture show how experimentation and creativity bring the most unexpected and intriguing solutions. Poorex presents the Poor Toys. Jakarta, Indonesia. Łódź Design Festival and Must have award for the Vice Clocks Collection. Must have is a poll, where we have showcased the most interesting products by Polish designers and manufacturers over the last four years. Lódź, Poland. The same exhibition during Stalowa Wola Design Days. Stalowa Wola. Poland. The second edition of Art in the Box, an exhibition that takes design to the streets, is to be organised at the Design September festival in Brussels. This year, over 20 Polish designers will present their projects in the Belgian capital. Brussel, Belgium. Artloop festival in Sopot. Poorex designed a special looped seat. Sopot, Poland. Opening of exhibition ” Usiądź po polsku”. The exhibition Polish Design presents a selection of works by 30 Polish designers. Concordia Design, Poznan, Poland. Polished Up – exhibition. Design from Poland. Abstract Hooligans – the exhibition, presents works that ironically play with abstraction. F.A.I.T. Gallery. Krakow, Poland. +48 Social Club it’s a place which will present to the Japanese public the best Polish graphic design products from recent years, and will also serve to bring closer to them the cultural context in which these products are used. Tokyo, Japan. „Polska in Between”. The exhibition of contemporary Polish design is to present different fields of manufacture, such as furniture, ceramics, fabrics, and typography. Istanbul, Turkey. An exhibition of Polish design for children, introducing furniture, accessories and toys for kids will be held at the Izmir Mediterranean Academy. Izmir, Turkey. The exhibition Polish Design presents a selection of works by 30 Polish designers.Brought together in this way, their projects provide an insight into the potential of Polish design and the mindset of Polish designers. Eindhoven, Holland. At the invitation of the Designblok Festival in Prague, there was presented a specially prepared for the occasion installation consisting of 20 watches from the Vice Clocks collection. Praha, Czech republic. For the launch of the Zaprojekowane book (which included also the Poorex studio activities), there were prepared 50 Brusch Car pieces of toys, that hit the hands of selected people along with copies of the catalogue. Alice: Wonderland Across the Road is presented at the Zachęta’s ground floor. Here the inspiration came from Carroll’s play with scale, perspective and space. Zachęta – National Gallery of Art, Warszawa, Poland. Poorex, in cooperation with the company producing printers – 3D Kreator – represented Małopolska at the fair in Brussels. Especially for this occasion, there were designed and printed inspiring and practical toys. „Inflatable emblem” as part of scenography during exhibition of polish design. Ventura Lambrate, Milano, Italy. The Exhibition ‘Polished Up. Design from Poland’ is a continuation of the ‘Unpolished’ project. During the imm cologne you can visit the new exhibition in hall 1. Cologne, Germany. The exhibition must have from Poland is now in Hong Kong! Inno Design Tech Expo. Lecture during „Excess and lack”– conference, ASP Wroclaw, Poland. Opening of exhibition „Bedzie się dzielo”, Bunkier Sztuki Gallery, Krakow, Poland. Participation in Design Lodz Festival, Lodz, Poland. Talk/presentation – Poorex and Paweł Jasiewicz with Dominik Lisik, Mocak Gallery, Krakow, Poland. Four years from a successful exhibition celebrating Young Creative Poland, the Adam Mickiewicz Institute (Warsaw) together with Creative Project Foundation bring Polish design back to Brompton Design District. The carefully curated exhibition will feature state-of-the-art Polish design. London, UK. must have award for The Poor Toys. 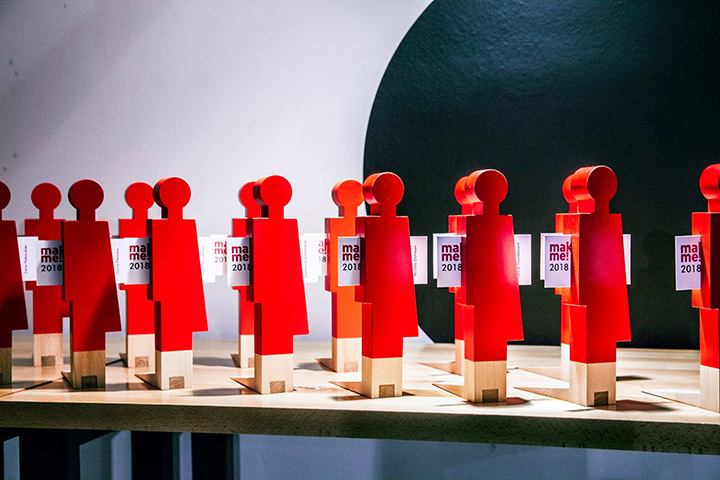 must have is a vote in which a group of experts, including media representatives and representatives of important design centres in Poland and abroad, has selected the most interesting, attention-worthy projects of Polish design. Exhibition of Polish Design „Materia Prima”. Munkeruphus Munkerup strandvej 78, 3120 Dronningmølle, Dania. Mobile Telescope (Poorex) in Gdynia Design Week. This year, everything what’s local will almost touch what’s the most important and fashionable in Poland and around the world. Gdynia, Poland. The Poor Toys in Sofia Design Week. International festival for design and visual culture.Sofia, Bulgaria. What’s for Breakfast? – Design from Austria, Czech Republic, Hungary, Poland, Slovakia & Georgia. Tibilisi, Georgia. Poland is the fifth guest country of DMY International Design Festival Berlin. In cooperation with Polish Institute Berlin, the focus presents showcases of over 40 design studios, companies and design schools. Berlin, Germany. Polska FOLK. Exhibition in a small city Oreszak, next to Trojan in Bulgaria. Organizer: Polish Instytut Sophia, Bulgaria. Toys made of concrete – running workshop. Faculty of Industrial Design ASP Kraków, Poland. Paraarchitecture – lecture/presentation.Głośna Club, Poznań, Poland. Opening of Design Shop in BWA Design, Wroclaw. Pop-Up. Design Between Dimensions, an exhibition presenting the work of artists and designers who are exploring the boundary between the second and third dimensions. Musée de design et d’arts appliqués contemporains (MUDAC) in Lausanne, Switzerland. Opening of Lodz Design Festival. First show of The Poor Toys collection. Lodz, Poland. Grass House is ready! Outer Spaces, Poznań. In the exhibition The Popup Generation, the former director of thee Design Academy Eindhoven presents designers and artists who, in collaboration with industry from the province of Brabant, are doing research into new ways of working and techniques. Design for Freedom – Freedom in Design Exhibition. Graphic Design in Poland 1981-2011, Berlin, Germany. Opening of individual exhibition „52 Lazy Weeks”, Projekt Kordegarda Gallery, Warsaw, Poland. Opening of exhibition „Close to home”, Lukas Feichtner Gallery, Vienna, Austria.